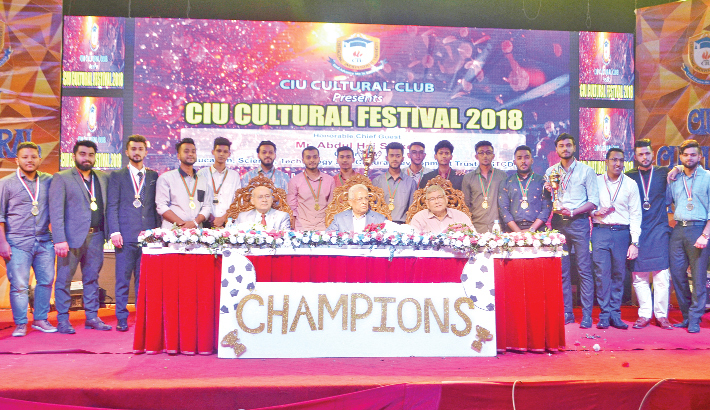 A cultural programme titled ‘Cultural Fest-2018’ was held amid festivity at private Chittagong Independent University (CIU) on Thursday. Education, Science, Technology and Cultural Development Trust (ESTCDT) Chairman Abdul Hai was the chief guest at the programme also attended by the university Trustee Board Chairman Towhid Samad, Vice Chancellor (VC) Professor Dr Mahfuzul Hoque Chowdhury, senior teachers and guardians. Addressing the programme, the ESTCDT Chairman Abdul Hai said cultural practice creates creative attitude in the mind of people. There is also no alternative to engage with cultural practice for achieving success in life, he observed. The cultural festival will surely encourage the CIU students to engage with creative activities, he said. The Trustee Board Chairman Towhid Samad said the campus life is always enjoyable and cultural practice opens doors for acquiring knowledge. It also helps develop enlightened students, he observed. The VC Professor Dr Mahfuzul in his speech informed that the university is going to start activities on its permanent campus soon. CIU Cultural Club Adviser and Convener Dr Robaka Shamser also spoke at the programme conducted by students Tabassum and Samrina. The university students enthralled the audiences with attractive performance of song, dance and play among others. The participants of the cultural programme were Jawad, Joy, Ayman, Habib, Tasfi, Fahmida, Rahia, Anirban, Soha, Nawshad, Amitabh, Seher, Moitree, Archi, Afsana, Atiya, Maria, Antu, Tanjin, Esha, Charu, Sawaf, Anik and Shahadat. The guests also handed over prize to the winner of the inter-department football competition organised by the Cultural Club earlier.